Is there a way to tell from the egg carton how old the eggs are? Are there some guidelines for how long eggs are safe to eat? According to the U.S. Dept. of Agriculture Food Safety & Inspection Service (USDA/FSIS), "By understanding the coding on the egg cartons, chefs and bakers can determine the freshness of the eggs. Each carton of USDA graded eggs must show the date of packaging, the processing plant number, and may include an expiration date. USDA assures that all labeling and claims made on the carton are truthful and accurate. To determine freshness, a Julian date or pack-date calendar can be used. This three-digit code indicates the date of packaging, starting with January 1 as 001 and ending with December 31 as 365. These numbers represent the consecutive days of the year. You can store fresh shell eggs in their cartons in the refrigerator for four to five weeks beyond this date." Plants not under USDA inspection are governed by the state laws where the eggs are packed and/or sold. Most states require a pack date as described in this article. For more information about state egg laws, contact your state's Department of Agriculture. 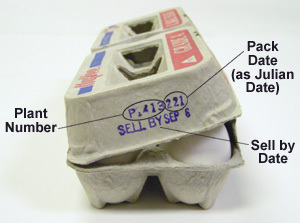 Always purchase eggs before the "Sell-By" or "EXP'" date on the carton. After the eggs reach home, refrigerate the eggs in their original carton and place them in the coldest part of the refrigerator, not in the door. For best quality, use eggs within 3 to 5 weeks of the date you purchase them. The 'sell-by' date will usually expire during that length of time, but the eggs are perfectly safe to use." Is an egg that floats still fresh? Proper cooking as well as proper storage is important for egg safety. Cook eggs thoroughly so both yolks and whites are firm, not runny. Casseroles and dishes containing eggs should be cooked to 160° F as measured by a food thermometer. Do not eat raw or undercooked eggs. Once eggs are hard-cooked, they should be refrigerated (in their shells) within 2 hours of cooking and used within a week. Refrigerate them in a clean container, not their original egg carton.